Rubber mill liner is a useful spare part for grinding machines, which can prevent friction and improve grinding efficiency. It is chiefly made up of a metal framework and wearproof rubber. Feeding inlet rubber liner is characterized by simple structure, stable performance, reasonable structure and easy installation. 1. Rubber mill liner can reduce energy consumption and absorb noise and vibration. It is environmentally-friendly and economical. 2. The feeding inlet rubber liner is durable and can be used twice as long as metal ones. 3. The rubber is elastic and stable, thus anti-corrosive. And it has small density. 4. 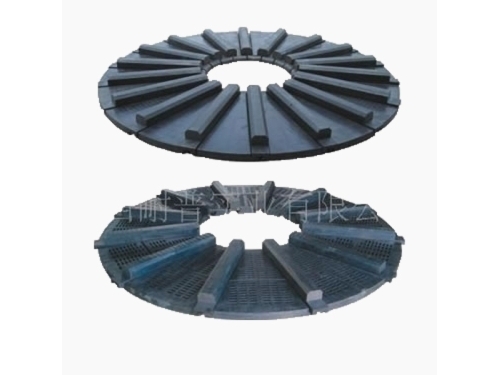 Rubber mill liner is easy to change and maintain. 1. Rubber mill liner should be packaged in iron cases. 1. Types of payment: L/C and T/T. Field installation and maintenance services can be offered providing the purchase orders of rubber mill liner reach a certain amount. As an experienced manufacturer, Naipu Company now makes slurry pump, mill spare parts (rubber mill liner), vibrating screen panels, composite pipe and hydraocylones. The company has national first-class double vacuum vulcanizing machine and Taiwan testing equipment. We employ imported natural rubber which has performance of high wear resistance and anti corrosion. All these lead to the wide popularity of feeding inlet rubber liner both at home and abroad.